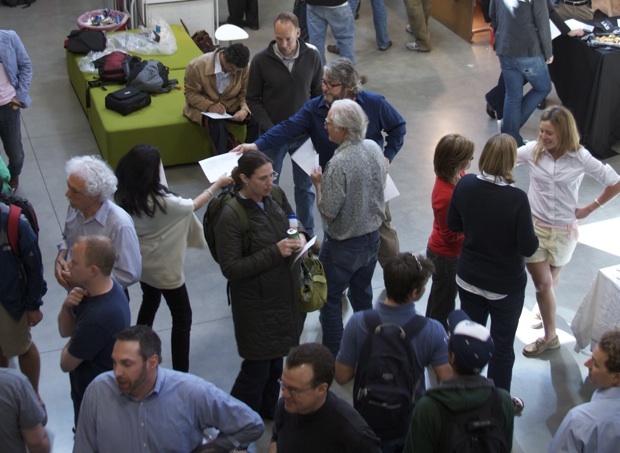 Launch Pad is a class at Stanford’s d.school taught by rock star entrepreneurs Perry Klebahn and Michael Dearing. Students are admitted to the class only if they have a business idea that can be prototyped and made actionable by the end of the quarter. At the mid-point in the quarter they class installed a Beta Trade Show in the d.school atrium and invited 100 people to check out their new business offerings. Live music was streaming over the speakers, and the daylight was flooding in through the overhead windows when the first guests arrived in the d.school atrium at 4 p.m. By the last two hours, the space had been transformed from an inviting open space with scattered tables into a vibrant showcase for new ideas. Eleven entrepreneurial teams then pitched their products to a live audience. 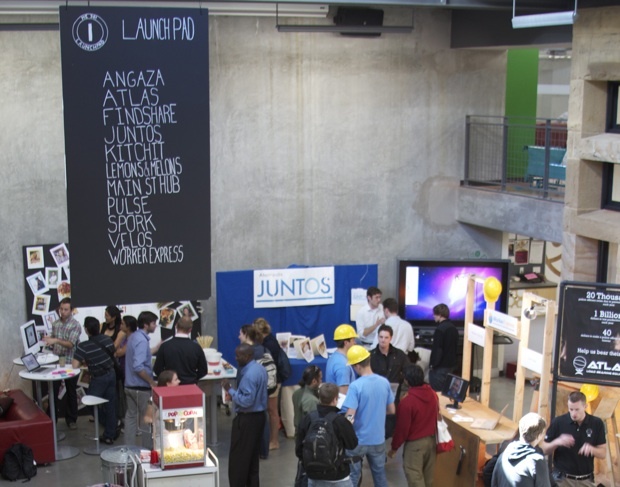 The products ranged from Juntos’ Web-based personal finance tools for Latino communities to Angaza Design’s affordable solar energy generation platform for off-grid East Africans. The mix of products and services showcased reflected the diversity of the interests in the class, which included students from the graduate schools of business, engineering, and law. The teams each constructed their own booths and were able to use the versatile space in the d.school for the event. Hosting the event in the d.school made it easy to include the rest of the d.community as well as friends from across campus. Additional invitations to this public event included local venture capitalists and angel investors. Jurors who circulated and provided written feedback to the teams on assorted aspects of their product and presentation. It was time to break down the show after two hours of steady traffic flowing through the atrium. As the last of the crowd dissipated the teaching team, Michael Dearing and Perry Klebahn acknowledged the students’ impressive work. By 7 p.m., the space had the original furniture back in place and all the popcorn swept off of the floor. The atrium was ready for the next day’s guests. — Erica Ostermann is a master’s student in the Policy, Organization and Leadership Studies program in the Stanford University School of Education. Her first introduction to design thinking was in the fall of 2010 in the Design Thinking Bootcamp class at the d.school. This experience helped change the way she approaches problem solving and has inspired her to use the d.thinking toolbox in her continuing work in higher education.